Every neuron in the visual system responds to visual stimulation of a restricted area of the retina: its retinotopic receptive field. In the cortex, the spatial preferences of visual neurons change slowly from one point on the cortical surface to the other, creating so-called retinotopic maps. 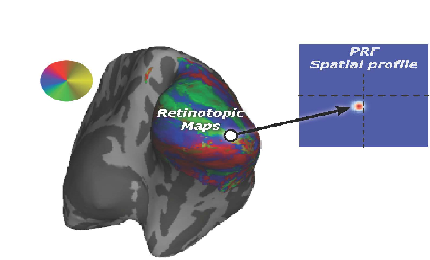 There are more than 15 retinotopic maps in the visual system of the human brain (see the colored bands in the figure, which each represent a region in visual space), where each retinotopic map samples a half-field of visual space, and is responsible for the computation of visual attributes such as color, depth, motion etc.